Should Tony Blair and George Bush be regarded as war criminals? 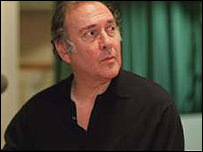 In a HARDtalk interview on 22nd December, James Rubin talks to the outspoken British playwright, Harold Pinter. The elections in Iraq, due to be held in January, are widely hoped to be the start of Iraqi democracy and the beginning of the end of British and American involvement in the country. There has been strong opposition to the war in Britain, and one of the loudest critics is the British playwright Harold Pinter. He believes Tony Blair and George Bush should be tried as war criminals.